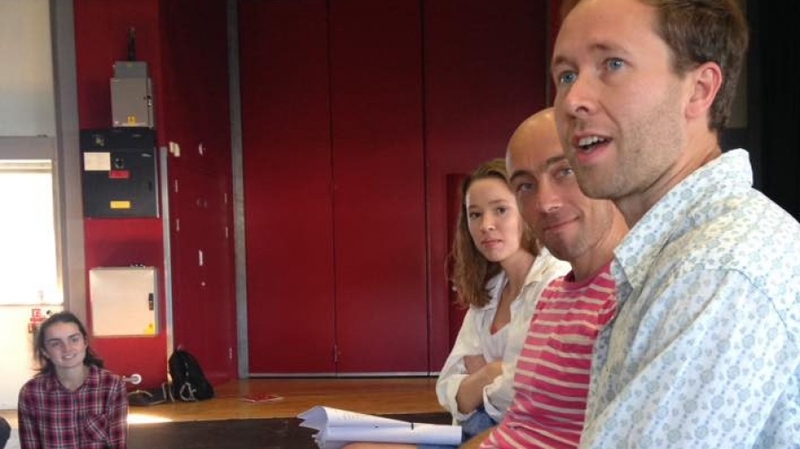 During rehearsals of the latest Young Company production Buckets, we were lucky to have the writer Adam Barnard come down to see how everything was going and chat with our Staff Director Lee Hart. I actually started out directing plays, not writing plays, and I didn’t know I was going to end up writing plays, so that was a surprise. In fact, it’s even more complicated than that, I started my career partly directing plays and partly as a newspaper journalist and I wasn’t quite sure which to do so I was writing but I wasn’t writing anything creative. Then theatre won the tussle and for most of the next decade I was a theatre director but it was like there was something missing and at a certain point I took a few weeks off and starting thinking about it and thought why am I not writing plays, I like writing plays. When I was much younger at school and absolutely loved any opportunity to do anything do to with creative writing from as young as I can remember and if you had asked me when I was 15 or 16 what I wanted to be I would have said a writer. I worked a lot with new writing as a director so I used the contacts I had to find opportunities to write. I started with short plays, there were lots of short play and fringe nights around London at the time, and I’d often directed for them so I asked if I could write for them instead. The first few things I wrote were super short 5 or 10 minute plays and then I graduated to longer pieces and in fact, Buckets was the first full length play I wrote. By the time I’d written Buckets I felt that I wanted to be a writer as much as a director and that’s where the last few years have gone. I’m not done with directing but I’m glad I have writing in my practice now. Describe a typical day at work for you? There really isn’t one, at the moment, for example, I’m both adapting and directing at the same time a Quentin Blake book. So I have the writer head on, doing bits of the script and I have the director’s head on, having conversations with the designer, the video designer and a composer. Then there’s days like today when I’m in the rehearsal room. What inspired you to write Buckets? As part of my quest to become more of a writer I applied for the Leverhulme Arts Scholarship and it was a new scheme being run with Bath Theatre Royal to create experimental and new work for young audiences. I pitched to write a play called Bucket List which was a relatively conventional story about a young girl who knows that she’s going to die young and as she became more sick, the play was going to disappear off into a surreal landscape in her imagination. I pitched this at the last minute and I got the scholarship and then I thought, this is a terrible idea! It was mawkish, sentimental and exploitative and it was doing the Disney thing of making you cry then offering some kind of redemption. I just had to rebel against my own idea and I was furious with myself for having even suggested it. In the course of thinking about the play I went back to the idea of bucket lists because there are often things we associate with the terminally ill, particularly terminally ill children and charities like the Make a Wish Foundation and I started to think about why I was interested in this topic because there wasn’t a personal connection, and I realised I was more interested in time and running out of time and how you decide what you do with it. Because I was so frustrated with trying to write this sub-Disney play I started to let of steam by writing little scenes which were more what I felt even though I didn’t think they were going to amount to anything and when I had about 10 of them and they were completely disjointed, I thought, well why can’t this be the play. Each scene was like a little bucket with a different thought in it. I then did something which I think is one of the most important things I’ve ever done and I gave myself permission to just carry on colouring outside the lines and eventually I had about 50 or 60 of these scenes, and some of them said the same thing in different ways and some were terrible and then I started to sculpt them into the 33 scenes that make up Buckets. I remember calling up the Leverhulme Scholarship people and saying is it ok if I don’t write the play I promised you and she said ‘we didn’t think for a second you were going to write that play, no one ever does’. Can you describe Buckets in 3 words? What’s the most challenging part of writing a play? Knowing when its finished. Certainly with this one because there were so many scenes to working out what’s the rational of what scenes go in and which ones don’t’ and the order as there was no master plan so how do you know when it is ready to go. I got to the point of thinking there’s no such thing as a ‘perfect’ version of it, just lots of different variations – which is why it’s so great to see a new production with different choices. You have to read a lot and see a lot, but you also need to allow yourself to be yourself in your work, which is much harder than it sounds. I’m still figuring out how to do that myself. I have to shut off parts of my brain and stopping thinking. I think most people who want to write plays find it hard to stop thinking. I always remember something that Sam Walters said to me, when I started off as a director at the Orange Tree Theatre. He said you always have the right to change your mind, he meant in terms of directing but I think it’s also a good motto for life. Can you name 3 things on your bucket list? Don’t miss Adam’s play Buckets while it’s in Plymouth next week from the 24th – 27th August. An interwoven web of stories, characters and moments – moments seized, moments wasted, moments you can never forget and moments you wish you could – a unique and entertaining new play about bucket lists, life planning and the disappointing fact that you’re not going to live forever.